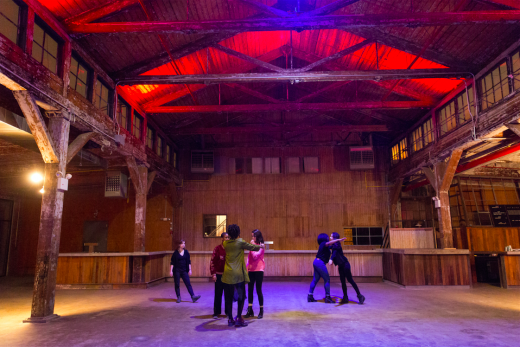 The project’s main rehearsal space is Bushwick’s Otion Front Studio, a small (290 square feet, compared to Knockdown’s 50,000) rehearsal and occasional event space that Monica and Sarah run. To get there, you must descend into a musky basement next to a Family Dollar, walk through a dimly-lit hallway and emerge into a backyard, where a small room lies. Inside, a Friday night rehearsal is underway, led by dancer, choreographer, and musician Richard Kennedy. The small space is almost otherworldly, illuminated only by lights that constantly shift colors. Though the early May weather is chilly and the air is thick with mist, it’s warm inside and the mirrors are fogged up from the active bodies. 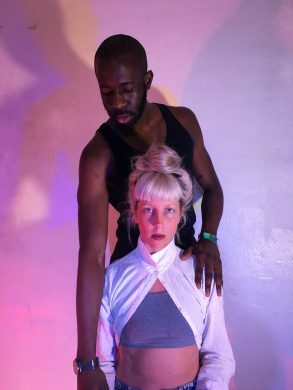 Kennedy is leading five dancers through group and solo choreography set to dynamic electronic music, sometimes spontaneously improvising sequences that the group picks up quickly and deftly. Though many of the 150+ performers in Authority Figure don’t identify as dancers or have dance training, the performers I observed certainly did. Kennedy, who has trained as a dancer for nearly his whole life, tells me he specifically asked to work with skilled dancers for his portion of the piece. All choreographers were told to create off of themes of authority and obedience, and Kennedy has chosen to explore the notion of formal dance as an authoritative force. This is just one small part of the massive undertaking—Kennedy’s section is only four minutes total. Interestingly, each choreographer has only been working independently up to this point. No one fully knows what the other is doing. This only adds to the mysterious nature of the piece, which the directors firmly call an experiment. “It will only happen once for everyone. Even if you come back it’s not going to happen in the same way. Can’t rewind, can’t press pause,” Mirabile adds. Despite its sprawling size, the project’s creative and production team is comprised largely of local, Bushwick-based artists. Michael Potvin (Nitemind), who is lighting the piece, runs the Stream Gallery in the same building as Otion Front. Monica works at Happyfun Hideaway (where this interview was conducted), and the bar’s owners also own nearby art space Secret Project Robot, where Authority Figure has also been rehearsing. 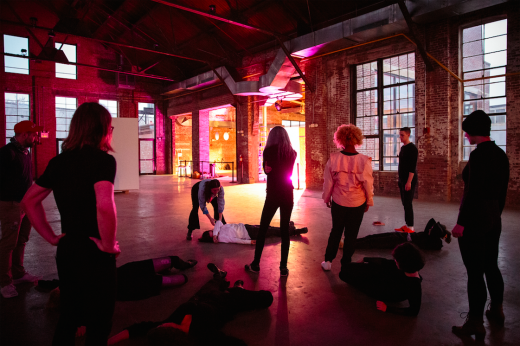 Working in small groups for most of the process was intentional, as Mirabile and Kinlaw felt it important to cultivate spaces of intimacy and friendship in the midst of creating something so large-scale. 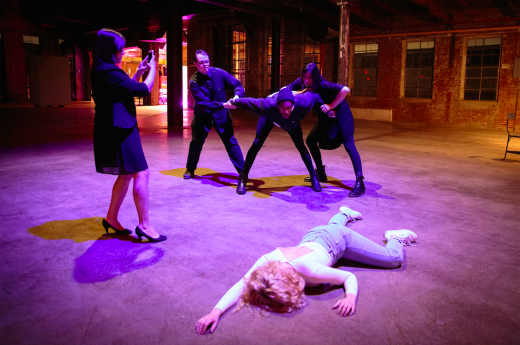 ‘Authority Figure’ runs May 20-22 at Knockdown Center, 52-19 Flushing Avenue, Maspeth. Tickets are $25. More info here. Check out their Kickstarter campaign here.